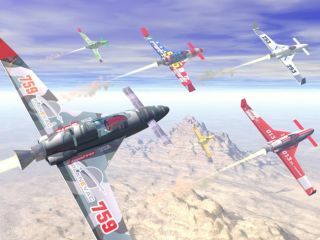 This artist's illustration envisions the flyby of a series of X-Racer rocket planes during a competition developed by the Rocket Racing League (RRL). Whenthe gates open on the X Prize Cup next month at the Las Cruces InternationalAirport, New Mexico, visitors will get a first-hand feel for a new type ofsuper-slick speedster--the rocket racer. TheRocket Racing League is pushing the throttle forward in the development of anew sport--a NASCAR-style racing league utilizing rocket-powered aircraft flownby pilots through a "three-dimensional track" that's plainly sky-high. Forthe motorsport-challenged among you, NASCAR stands for the National Associationfor Stock Car Auto Racing (NASCAR), the largest sanctioned venue of its type inthe United States. While NASCAR takes it to the roadway, the Rocket RacingLeague takes it to the air. The League is power-charged to acceleratetechnology in the areas of airframe, propulsion and spacecraft design--and haveflat out fun at the same time. Inthe early years of this new sport, each rocket-powered X-Racer will be based onan existing airframe, but modified to carry a 1,500 pound thrust rocket engineburning liquid oxygen and kerosene. The single-pilot, first generation Mark-1X-Racer is expected to reach maximum speeds of more than 320 miles per hour. X-Racersare designed to be rapidly refueled, a pit stop that would be on the order offive to ten minutes. Even faster refueling techniques are expected to bemastered as the Rocket Racing League develops over time. IndividualX-Racers will be capable of roughly four minutes of intermittent engine boostand 10 minutes of un-powered flight. That will permit three to four laps aroundthe air course between pit stops. Thevirtual airspace that X-Racers will speed through is some 10,000 feet long,3,000 feet wide and 5,000 feet high. Pilots will navigate the course throughuse of Global Positioning System (GPS) satellite technology and a heads-updisplay within the cockpit. This virtual course may be supplemented with realobstacles such as inflatable pylons and balloons, as well as spotlights andlasers during nighttime races. Nowbusily at work on the Mark-1 X-Racer engine is XCOR Aerospace, headquartered inMojave, California and known for its expertise in safe, reliable and reusablerocket engine development. JeffGreason, President of XCOR Aerospace, has noted that progress is being made onthe rocket racer motor--including static test firings to 100 percent thrust onthe engine. "We are proceeding with power plant development leading to safe,successful flight," Greason said in a recent XCOR press statement. "Wehave fired the rocket motor for the racer repeatedly...and it's running withinour time schedule," said James Busby of XCOR's media relations. The officialdesignation of the liquid oxygen/kerosene powered engine is the XR4K14, headvised SPACE.com. Whileprogress is in the wind, the Rocket Racing League has raised a yellow flag onflying the Mark-1 X-Racer during the X Prize Cup festivities October 20-21 in Las Cruces, New Mexico. The League had hoped to accelerate the development schedule aheadof the vendor's commitment, but that has not been possible. "We'reholding off on flying until we're prepared from a business standpoint...it hasnothing to do with the technology," said Granger Whitelaw, Chief ExecutiveOfficer for the Rocket Racing League. "The technology is 100 percent there. Thevehicle and the engine are on track as far as that goes," he told SPACE.com. TheRocket Racing League has already taken delivery of its company-owned Mark-1X-Racer trainer, crafted by Velocity, Inc. of Sebastian, Florida. This plane--poweredby piston engine--eventually to be replaced by rocket engine--will serve as atraining vehicle for rocket racing pilots. A second Velocity, already owned bythe League, is currently undergoing modifications, including the installationof a rocket engine, by XCOR Aerospace. Creatinga brand-new 21st century sport like rocket racing is not without itschallenges, Whitelaw explained. He's no stranger to blending business with high-speedhardware as a two-time Indianapolis 500 champion team partner. "Justpulling everything together at the same time...it's all about execution for us,"Whitelaw said. "There are so many different pieces that we're doing to bringout a major brand...a major sport in the aerospace/aeronautics world." TheRocket Racing League was co-founded and chaired by X Prize founder PeterDiamandis. Whitelawhighlighted the League's push in technology innovation. The competitiveenvironment, the high-heat from racing conditions, and the professionalfeedback from the pilots - all this and other aspects allows the Rocket RacingLeague to serve as a test bed for research and development. "Therehas never been that environment for aerospace or aeronautics...and now there'sgoing to be," Whitelaw added. Overthe next week or two, as well as at October's X Prize Cup, Whitelaw concluded,standby for surprises. "We have some exciting things we're going to beannouncing...so stay tuned."